Elaine made the cute cupcake pot holders as shown @ janesfabrics blog, Sharon P A camp gramma made the stars & strips block that I love, and Snoodles @ lilypadquilting made the innovative firecrackers. I will be sending Sallie, 1/2 yard of the Patriotic Flag Fabric as soon as she sends me a mailing address! Look at this stunner in Today's RWB Blocks!! I'm up for Saturday June 7th...gotta go finish some last minute stitches. Congratulations, Sallie! 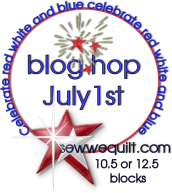 Thanks to everyone for sponsoring the giveaways and blog hop! 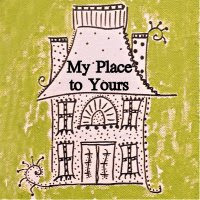 Congrats to Sallie and thanks to you for hosting this fun blog hop!!! Thanks so much Gmama Jane for featuring my block here today! It is an honor!!! Happy 4th of July to you, too!